"World Peace Through Law" — "One World Government" — these are the cherished hopes of mankind for the future. Today, government leaders recognize WORLD GOVERNMENT is the only hope for lasting world peace. But take a long look at the greatest attempts of man in all history to put together such a world government. What do you find? It's time you recognized no human government knows the WAY to world peace! THE UNITED NATIONS is in trouble. Envisioned by world leaders as the ONLY way to lasting peace after World War II, the United Nations organization was formed, a building site donated by the Rockefeller family and an impressive, modem building complex erected to house the many offices and conference halls. The record is not unimpressive. There have been some successes, some failures. But too many of the international disputes to come before the United Nations have tended to remain unsolved — like running sores between governments. And today, the headaches seem to outnumber the successes. With the two Chinas, the Cold War, the Middle East crisis, Vietnam and dozens of little hot wars to worry about, the UN finds itself heir to a whole host of problems not remotely envisioned by its founding fathers in the early postwar years. Take a brief look at some of its past occurrences in retrospect. It seems almost like the fulfillment of an old household slogan, "Hindsight is better than foresight." And, to millions of us, the archaic attempts at world peace after World War I by the League of Nations appeared, in 1941, unbelievably shortsighted. We saw, in retrospect, the terrible inadequacies of the Treaty of Versailles, all of the faults with the shortsightedness of the Western allies — the problems inherent in the Danzig Corridor, the refugee problems, the Sudetenland, the Saar and Czechoslovakia. Suddenly, in 1939, it began to crystallize. Finally, in 1941, on December 7, it came sharply into focus for Americans who preferred to dream and play on their island of security in the midst of a world in ferment. And now, in this modern age, we see in retrospect the failings at Yalta, Teheran, and Potsdam. We see the shortsightedness of Western planners in allowing a nuclear stalemate to occur; a divided Berlin, Germany, Korea, and the almost staggering lack of initiative on the part of the West to win the peace after they had won the war! My father, Mr. Herbert W. Armstrong, was an accredited press correspondent attending the world conclave in San Francisco for the formation of the United Nations Charter in 1945. He saw and heard there the greatest statesmen in the world, including Britain's Clement Attlee and Russia's Foreign Minister Vyacheslav Molotov, solemnly admit the United Nations was the world's "LAST CHANCE" for peace. No truer words were ever spoken! The United Nations DOES represent man's greatest single effort in all history to bring ALL nations together in mutual understanding and cooperation. Take a brief look at the record. Since those fateful days, more than sixty wars have been fought, the world has been hurled from the machine age to the jet age through the nuclear age and into the space age, and many wars are still blazing today! Leaders in some of the big powers have warned the United Nations HAS ALREADY FAILED. Many have called it a "sounding board" for Communist propaganda. And today, the headaches seem to grow only larger, and more insistent. In a conference on world law, Secretary General of the United Nations IJ Thant said, "What element is lacking, so that, with all our skill and our knowledge, we still find ourselves in the dark valley of discord and enmity? What is it that inhibits us from going forward together to enjoy the fruits of human endeavor and to reap the harvest of human experience? Yes, what element (or elements) is lacking? We shall see — and see very clearly! Government is much more than just big business — requiring educated men. Government should require a vast amount of education: in true history, government, languages, true and proven science, literature, and in all fields! Right governments should require kindness, selflessness, understanding, equity, trust, patience, and faith. It should require men of courage; capable of great personal sacrifice; completely HONEST men, who always tell the truth, even to their own hurt. It should require understanding of the deep racial, social, and economic problems — the problems of health, education, and welfare, of conservation, of labor and management. It SHOULD require a depth and grasp of HUMAN NATURE, and real dynamic LEADERSHIP! It SHOULD require all these qualities, and a great many more. But contrast these vital prerequisites to rule with the spectacle of governments on this earth. INSTEAD of law, order, education, understanding, magnanimity, longsuffering, patience, kindness, justice, equity, ,trust, faith, a deep grasp of human nature, total lack of racial and religious bias, and all of the lofty qualities which SHOULD go into any government — you find selfishness and egotism, desire for personal power, graft and corruption, lying, cheating, injustice, and many inequalities. Take a look at many of the new African states. For instance, Rwanda's President has no telephone in his palace in Kigali. Periodically he sends a minister driving off to neighboring Uganda to find out what is happening in the world. Also national pride engenders pretensions as well as problems. Impoverished Dahomey boasts a $6,000,000 Presidential residence that is larger than Buckingham Palace. Mauritania has a Directorate of Forests and Waters, though it has no forests and precious little water. Striving for independence, "Uhuru," nation after nation entered into horrible tribal conflicts; self-seeking leaders turned to sources of military aid (sometimes Red China) to aggrandize their own position of power; nepotism, graft, corruption, and bloody purges reigned. Leaders were assassinated, bloody civil wars fought, and the ancient question of whether to spend national wealth on guns or butter was resolved by plunging into debt for costly arms. The people continued to suffer. Look at the lesson of Cuba. From the clutches of one despot, the people leapt wildly into the arms of another tyranny which made the first look benevolent. One dictator is replaced by a worse dictator. Human government, no matter how well-intentioned some few idealists may be, usually degenerates into chaotic disarray. Well-meaning heads of state soon find themselves propelled, even against their will, along avenues not of their own choice; forced into making decisions which they know will come back to haunt them. There is no more volatile issue on earth today, and particularly is this true of the United States, than the issue of WRONG GOVERNMENT! NONE of the governments in this world today have brought this world peace. NOT ONE of the governmental systems of this world has brought a REAL and a LASTING peace, even for its own peoples! Look at the tribal bloodshed in Africa; the violent religious battles in Vietnam; the stifling economies of much of Latin America; and impending famines in India; the worsening crime, deepening moral decay, and the sickness of "too much" blighting the big powers! There is no peace today! Not in all human history has ANY attempt of mankind to govern himself led the world toward peace! Today, we are closer to HUMAN EXTINCTION through the squabbles of GOVERNMENTS than ever before in human experience! Point out the government that has brought the world peace! Identify, if you can, the ONE GREAT SYSTEM that has ALWAYS SUCCEEDED! Just as two plus two still makes four, so does the very FACT of mankind's searching for PEACE, MAN'S WAY, always lead toward greater wars! All statesmen recognize the stern fact that WORLDWIDE government is the ONLY solution to man's ills. They know only a SUPER WORLDWIDE government, embodying ALL nations, with WORLD courts, world laws, and a world police force could ever succeed. And yet, they know such a government in the hands of men is IMPOSSIBLE! A world government? That would mean every nation would renounce its own sovereignty. It means an immediate solution to the deepest problems dividing the human race! It means immediate solutions to all the monstrous problems of RACE, language, and education! It would mean a complete revision in the perspective of history, as it wildly differs in different nations; it would mean immediate 'TRUST between all nations, immediate disappearance of all nationalism, chauvinism, racism, rightism, leftism, communism, capitalism — and the immediate adoption of one world religion! It would mean human beings would suddenly QUIT being vain, selfish, suspicious, hostile, truculent, nationalistic, egotistic, proud, lustful, jealous, greedy, steeped in their own traditions, and deeply committed to their own religious faiths. It would mean mankind would SUDDENLY have to become HUMBLE, meek, long-suffering, easy to be entreated, slow to anger, magnanimous, selfless, loving, sharing, giving, understanding, eager to listen, always believing the best, never speaking evil, totally honest, completely CHANGED! If You Were to Become a "Citizen of the World"
Put it this way: If YOU were representative of YOUR government — and were considering membership in a WORLD government — here's what it would take for you and all your people to succeed! You would have to immediately GIVE UP ALL your own national history, with its colorful and "quaint" traditions — realizing that one WORLD history book would have to be written, not always showing the past of YOUR nation in the same light in which you have been accustomed to viewing it. All your national CULTURE must go. The reasoning you follow when you see someone else accomplishing an act, and say, "we do it better." All national PRIDE is out the window, and all national CONSCIENCE. Your stirring of heart at all the old songs, the old wars of yesteryear, the old heroes — the graveyards filled with your "glorious" dead — all the traditionalism, ceremony, culture, art, literature — it all goes. And all feelings of love for COUNTRY must go — since there will BE no such things as different countries! Your natural suspicion toward other languages, races, religions and cultures must go immediately! Your feelings about black, yellow, brown, white, about health and hygiene, about marriage and social customs, about clothing, dress, and even your way of eating must give way to a new "world" culture! And everything which would be a REMINDER of these things would have to go. Your old pictures, uniforms, dresses, scrapbooks, sheet music, mementos, records, and all reminders of any past military experience must go. And so must all old chants, marches, songs, and military cocktail toasts! Do you begin to realize the truly IMPOSSIBLE PROPORTIONS such a solution takes on? And WHO WOULD RULE? Would members of ALL races be present? And WHAT POWER WOULD ENFORCE that rule? What if two or three members of one race, representing different countries, decided against this deep uprooting of all nationalism — and pulled out of that one world government? Who would decide to punish them? HOW would they be punished? What if they had NUCLEAR WEAPONS — hydrogen and atomic bombs? Who would head the WORLD POLICE FORCE? How would it be controlled? What if a black policeman arrested a white citizen of the world, and other whites, not having totally overcome their racism, resented it? Would YOU be satisfied with such a solution? Are YOU ready to make such changes, and make them IMMEDIATELY? It's about time you saw once and for all there IS NO MAN-MADE SOLUTION FOR THE DEEP GOVERNMENTAL SICKNESS OF THIS WORLD! World government will work in spite of the overwhelming problems of this world today. Today it has come God's time once again to proclaim the good news of the real solutions to this world's ills. And, true to what most world leaders have recognized, the answer is ONE WORLD GOVERNMENT! Christ then explained how we would be living in a time of ''wars and rumors of wars" with great empires and kingdoms vying for world rule! Hard on the heels of a time of war, with only brief resting periods in between rounds of WORLD WAR, Christ said we would enter a period of drought, famine and increasing earthquakes and natural disasters! Down through the past three decades and more, our publications have carefully catalogued each one of these, with articles substantiating and corroborating these remarkable prophecies of Jesus Christ — showing how vividly and remarkably accurate they are, and how we are, believe it or not, living in the very time He predicted nearly two thousand years ago! But just PRIOR to the truly horrifying outbreak of worldwide CALAMITOUS events, described in the Bible as "the Great Tribulation," Jesus Christ said the GOOD NEWS of the coming Kingdom of God would be preached in all the world, as a WITNESS and "then shall the end come" (Matthew 24:14). And a part of that prophecy is being fulfilled before your very eyes this instant! Somehow, you have come in contact with the very Work of God which Jesus Christ predicted would be active on this earth at this time! We, of The WORLD TOMORROW program, this magazine TOMORROW'S WORLD, and the many books, booklets, and articles on various subjects concerning this wonderful GOOD NEWS which Jesus brought, are your WATCHMEN to proclaim, the impending disasters which are going to strike mankind — and which are SURE — and also to proclaim the good news to you and to anyone who will listen or read that there IS a way out — that there is hope of a solution in the years just ahead! The complete picture of why world government is so necessary, and HOW it will finally come about, and what it will be like is too lengthy, and requires far too much in-depth expounding of the literally dozens of scriptures which plainly speak of God's government of the future, to explain completely in this issue. 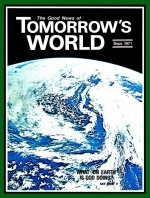 So if you want to read the step-by-step solutions, even to such global problems as race, religion, wars, drought and famine, pollution, and all the other problems that plague the human race, then read our free booklet The Wonderful World Tomorrow — What It Will Be Like?. In it, you'll see thoroughly expounded the plain scriptures which show specifically what some of the solutions are! You'll see a preview of the very Kingdom of God RULING on this earth, like being projected forward in time, right on out into the future — into the world tomorrow!